Great Rates for Black Eagle Luxury, Ski in/Out, Amazing Views! 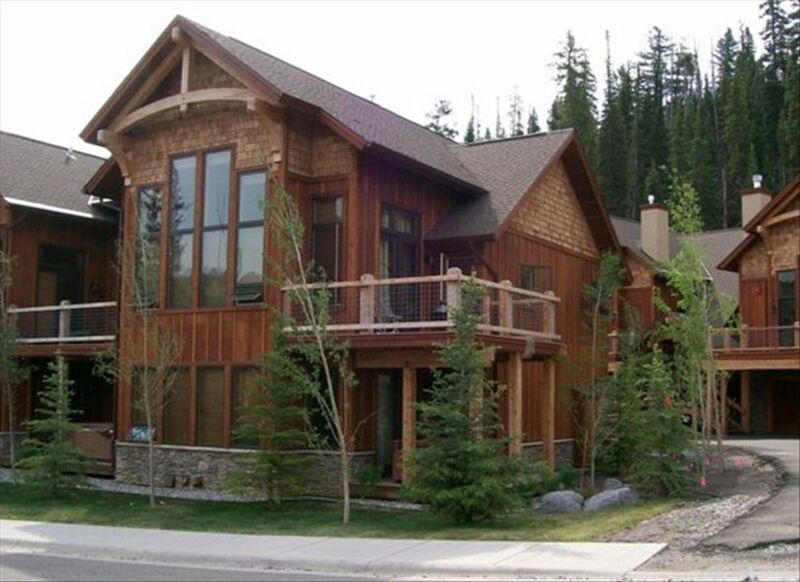 This wonderful year round family vacation property is located at the Big Sky mountain village within easy walking distance of the Bear Back Poma lift, village restaurants,shops and entertainment. You'll feel at home in the rustic elegance of this spacious three level condominium while enjoying the stunning views of Lone Mountain and the Spanish Peaks. This condo has rich amenities and luxury decor throughout. An open forum great room, gourmet kitchen, and dining area with large breakfast bar, is great for sharing meals and relaxation before and after enjoying a day of Big Sky activities. Sliding doors lead to upper and lower decks where you can take in breathtaking views of Lone Mountain while cooking on the grill just steps from the kitchen, or soak in the comforting 6 person hot tub located right outside the lower level family room. This vacation home has been set up with relaxation,comfort and family FUN in mind. Besides an abundant selection of outdoor activites, guests will find a selection of videos, books, and board games for their enjoyment. If staying 'connected' is a must,free DSL and WiFi access is available. BIG PLUS -- you can avoid the need for a rental car if you stay in this location!! Guests will have use of the ground level attached two stall garage equipped with boot drying and ski racks, and plenty of storage for your ski or fishing equipment. We are excited to share our special vacation home with you and help make your Big Sky experience a memorable one for you and your family/friends. EARLY BOOKING BONUS: Confirm reservation by November 15th and receive a 10% per night discount! Several years ago, my father told my brother and I that he was thinking about getting a condo in Big Sky, Montana. He told us that he thought it would be a great family vacation home as we all enjoyed skiing, fly-fishing, and the outdoors. After a very long explanation of why this would be such a great family vacation spot, my brother and I looked at each other and said, 'You just want to go fishing, don't you.' Our father smiled, and said, 'Well...' Since that moment, our condo has been more than any of us ever imagined. It has been a family vacation home, a relaxing retreat, a place to reconnect, and most of all, our favorite place to go on vacation. We enjoy everything about Big Sky. The skiing, the hiking, the fly-fishing, the fresh air, the scenic views, the starry nights, the wild animals. It all makes for a one-of-a-kind vacation. Big Sky is our favorite place, and we hope that after your visit, you will feel the same way. With the Bear Back Poma lift less than a block away, you can be on the slopes in no time. The Poma lift provides easy access to the main lodge and Lone Mountain lifts. (5) A telephone and answering machine are provided on the desk area in the great room. The two stall garage is located on the back side of the condo and has built in ski-boot drying racks and plenty of room for ski or fishing equipment. Wireless internet is provided for those emergency emails or projects. The wireless code is available in the renter handbook. The stainless steel dishwasher makes cleaning a breeze so you have more time to enjoy with family and friends. The stainless steel refrigerator has plenty of room to store food for a large group. It is best to buy groceries in Bozeman because there is no grocery store in the mountain village. Need a quick meal or want to make some popcorn? This stainless steel microwave is your answer! The fully stocked kitchen is equipped with a stainless steel refrigerator, dishwasher and microwave, a gas-range and a beautiful bar area with seating for four. It's time to impress your family and friends with your cooking skills while everyone relaxes in the great room. (2) DirectTV is available on both flat-screen TVs, which are located in the main floor great room and the lower level family room. XM stereo is available throughout the main level, so enjoy some tunes while you eat dinner or relax on the deck. A selection of over 20 DVDs make for a perfect movie night in the lower level family room. The upper level deck is right off the main level great room and has amazing views of the surrounding landscape. This is our favorite place for a glass of wine or a beer after a long day of skiing. The lower level deck is right off the lower level family room and has a 6-person hot tub with spectacular views. The 6-person hot tub is located on the lower level deck just steps off the lower level family room. From the hot tub, guests have amazing views of Lone Mountain. We enjoy the views during sunrise and sunset best! NO CAR RENTAL NECESSARY HERE. Shuttle service is available to and from the airport for a fee. We loved every bit of our stay here! It was an ideal house for our family of 5! We could not have been more comfortable. We loved the open layout. We are sad to say goodbye. The house was beautiful and fully equipped with everything you would need. Very clean. The location can't be beat, quick easy walk to the main base area. Owners were responsive and easy to deal with. Would definitely stay there again. We had a wonderful time at this place. Everything was super clean and spacious. Would 10/10 stay again. Wow! What a beautiful, clean, comfortable and well stocked home. We had such a great stay. Loved everything about this place. The kitchen is very well stocked if you plan to stay in, which we did many nights. We stored our skis at the base and walked up and down everyday which was easy and not far. We did not use the black bear poma. We rented a car and it was easy to get around to restaurants and stores near Big Sky. The skiing was amazing, the area is stunning and we will definitely be back. We had one maintenance issue that was addressed very quickly and thoroughly. We highly recommend. Wonderful home. Great for a family vacation! We couldn’t have been more pleased with our stay! From Black Eagle #9, Yellowstone National Park is only an hour away. Yellowstone offers families endless activities and spectacular beauty. World-class fly fishing is only 15 minutes away. The Gallatin River is a favorite of Montana residents and a hot bed for large trout. The Madison River is also only 1 hour away.